(Nanowerk News) Energy storage systems are one of the key technologies for the energy turnaround. With their help, the fluctuating supply of electricity based on photovoltaics and wind power can be stored until the time of consumption. 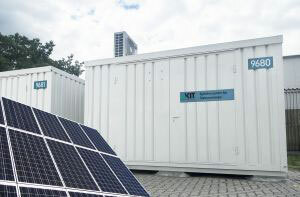 At Karlsruhe Institute of Technology (KIT), several pilot plants of solar cells, small wind power plants, lithium-ion batteries, and power electronics are under construction to demonstrate how load peaks in the grid can be balanced and what regenerative power supply by an isolated network may look like in the future. The Competence E project is presently developing several pilot systems consisting of photovoltaics and wind power plants coupled to a lithium-ion battery. Over a development phase of two years, a worldwide battery screening was made. “Now, we know which lithium-ion cells are suited best for stationary storage systems,” says Gutsch. The first stage of the modular systems will be constructed on KIT Campus North by the end of 2012. It will have a capacity of 50 kW. A newly developed, gear-free wind generator that is particularly suited for weak wind regions will complement electricity production by the photovoltaics system in the winter months in particular. The first stage will be able to cover electricity consumption of a medium-sized company throughout the year. In the long term, the know-how obtained will be used to develop smaller storage systems for private households as well as larger systems for industry. Apart from the battery, the key component of the stationary energy storage system is an adapted power electronics unit for charging and discharging the battery within two hours only. Hence, the stationary storage system can be applied as an interim storage system for peak load balancing. During times of weak loads, solar energy and wind electricity are fed into the battery. At times of peak load, the energy from the photovoltaics system, wind generator, and battery is fed into the grid. Apart from load management, night discharge is of significant economic importance, because consumption of photovoltaics energy by other electric devices of the user can be increased considerably. The battery is charged in the afternoon and discharged during darkness until the next morning. “Controlling the interaction of solar cells, wind generator, storage systems, and the grid is the central challenge,” Gutsch explains. System control always has to reliably and precisely interfere with the multitude of operation states. Only this will ensure a good service life and performance of the lithium-ion batteries in the long term and, hence, economic efficiency of the complete system. “Such a system can be controlled 24 h a day and 365 days a year with detailed battery know-how. Only then will economically efficient and safe operation be guaranteed for decades,” emphasizes Gutsch. After first functional tests, concrete application systems of variable power will be produced in cooperation with industry. In spite of the high costs of lithium-ion batteries, this technology may be worthwhile today already, in particular in regions that do not have any stable grids. Smaller and larger islands, for example, are often supplied with electricity by diesel generators. In Africa and India, large areas are not supplied with electricity at all. A photovoltaics system with a coupled lithium-ion battery can be applied profitably, if appropriate system design and load profile are chosen. With decreasing costs of system components, we will achieve “battery parity” in Germany, in analogy to the “grid parity” already reached for photovoltaics-based electricity consumption by the private customer.